In French, à table literally means “at the table”. Equivalent to “lunch (or dinner) is ready,” the phrase, à table!, is used in many French homes to let people know when the meal is ready to be eaten. The first time I heard of this phrase, I knew I wanted to use it in my home tout de suite. To me, it signifies much more than the meal is ready. It’s also about deciding to eat well—to slow down, stop what you’re doing and take time to eat (and only eat) at the table. That means no TV, telephones, iPads, toys, books, magazines, eating at the wheel, or on the subway. Eating should be considered a pleasure that commands our full attention as we savor each bite. The French are known for doing this well. They don’t eat while on the run. Although traditions may be changing, generally the French are known to enjoy the culinary pleasures of life by taking time to fully enjoy meals at table. This is something most learn from early childhood. Before I had my son I was guilty of eating meals on the go—a quick breakfast while standing at the kitchen counter, lunch at my desk in my office, a quick snack for dinner or skip it all together, if I wasn’t eating out. I used to think I was efficient. Well, there’s nothing chic, healthy or lovely about that kind of efficiency. I think many of us in North America have forgotten the pleasure of sitting down at a beautifully set table for at least one meal a day to savor and give meaning to the moment. Now, my priorities and habits are changing. Food and the rituals or rhythms associated with meals at the table are now pleasures I strive to take seriously. A well-set table, for example, can be almost as important as the preparation of food itself. The power of presentation is that it can help us be mindful of what lies ahead, whetting the appetite for a fuller, more enjoyable and meaningful culinary experience. Modern living can make it challenging to establish rituals around eating, but they are key to our well-being. Rituals can compel us to concentrate and be mindful of the moment, slowing the meal down and promoting satisfaction. They help cultivate good table manners, particularly in children. And, they help us do something we should all strive to do—to treat each meal as something special, a pleasure to take seriously. 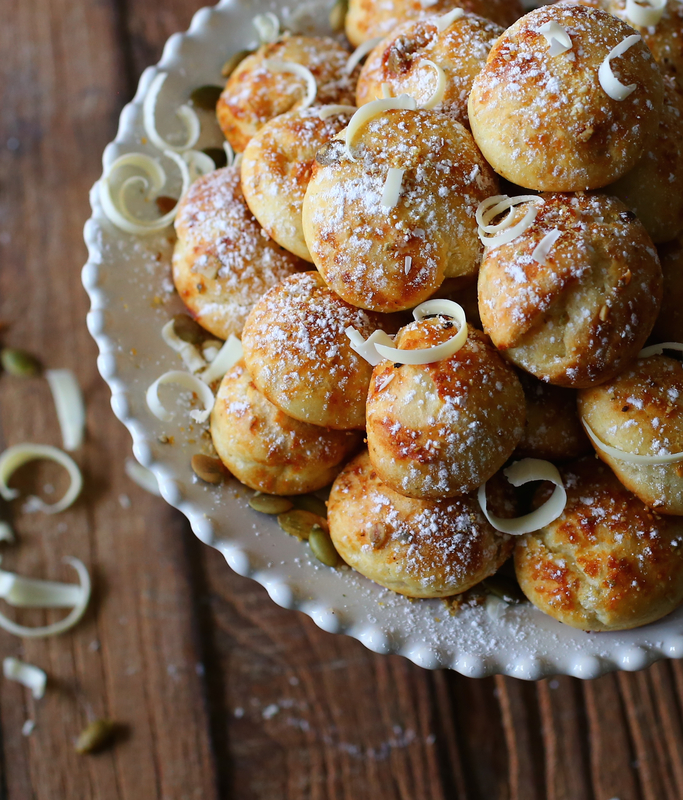 Little pumpkin and white chocolate cream puffs are somewhat of a culinary union between France and the U.S. for the celebration of Thanksgiving. These decadent little puffs are filled with a seasonably flavored and delicate sweet cream, and can be served with a small dollop of ice cream for dessert or with a warm cup of tea. Melt chocolate in large heatproof bowl set over saucepan filled with 1-inch barely simmering water, stirring occasionally, until smooth. Remove from heat and let cool slightly, 2 to 5 minutes. In a mixer, combine melted butter and white chocolate. Add crème fraîche, then pumpkin purée, salt, cinnamon and orange zest and mix until combined. Refrigerate to cool. Meanwhile, using a stand mixer fitted with a whisk, whip cream on medium-low speed until foamy, about 2 minutes. Increase speed to high and whip until soft peaks form, 1 to 3 minutes. Using a rubber spatula, fold in whipped cream to the pumpkin and white chocolate mixture until no white streaks remain. Refrigerate to cool. Place pumpkin seeds on a baking sheet lined with parchment paper. In a small saucepan over medium heat, add sugar and stir until light brown and liquefied. Pour over pumpkin seeds and allow to cool to room temperature. Once caramelized, mix in a food processor until it crushed and a bit like powder, but leave a few larger pieces of caramel and pumpkin seeds. Combine in a large saucepan milk/water, butter and salt. Bring the mixture to a full boil over medium heat. Add the flour all at once and stir vigorously with a wooden spoon. The mixture will look rough at first but it will suddenly become smooth, at which point you should stir faster. In a few minutes the paste will become dry and not cling to the spoon or the sides of the pan. Do not overcook or over-stir at this point, or the dough will fail to puff. Transfer to a bowl and let cool for 5 min. Add eggs, one at a time. With a wooden spoon or on low speed with an electric mixer, beat rigorously after each adding each egg, making sure the dough/paste is smooth each time before adding the next egg. The dough should end smooth and shiny. At this point the dough can be covered and refrigerated for up to 4 hours. I prefer to refrigerate at least an hour or even overnight. You do not need to bring the dough to room temperature before shaping and baking. Using a pastry bag or small spoon, form dough into approximately 1-inch dollops (balls) on an ungreased cookie sheet. Sprinkle each ball with the croustillant and bake until golden brown, approximately 25-30 minutes. The puffs should be nicely “puffed” up. Watch carefully as oven temperatures may differ. Allow to cool completely. When cooled, turn each puff over and using a small knife to make a small incision underneath each puff. Using a pastry bag, slightly fill each puff with the pumpkin and chocolate cream. Thanks Fae. 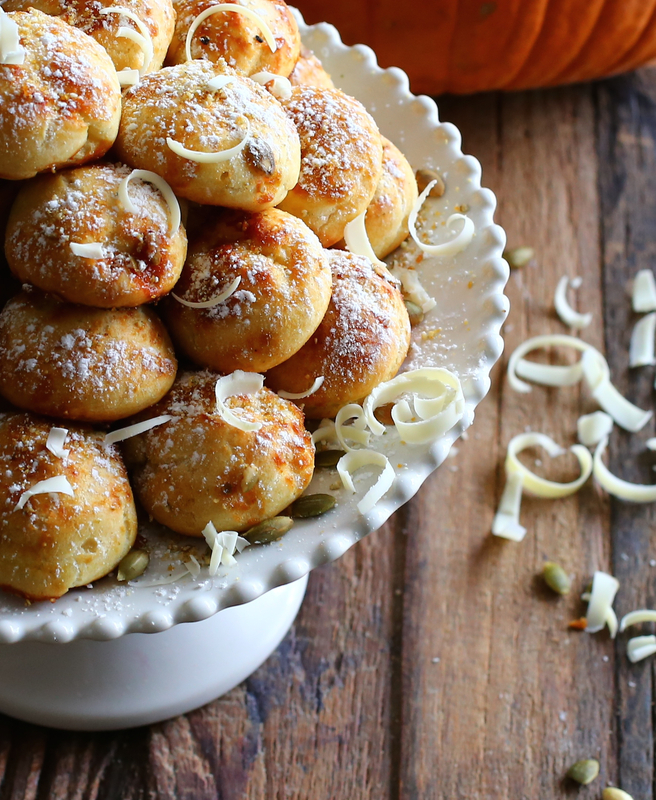 These little pumpkin choux are a bit on the decadent side. 😉 Also, my little one is so happy to hear it when I say “à table”, especially at breakfast when he is quite hungry and ready to start the day! Martine, these are gorgeous :). Coucou Stèphanie. Gros merci pour ton commentaire et compliment! à bientôt, bises. These are so beautiful. I love the idea of the French call to dinner and slowing down. These are my philosophies too. I love everything about this post, recipes and photos! Thanks so much Amanda. I’m glad to know that this post resonated so well with you. Wow delicious recipe and amazing photography! Thank you very much! Really happy you like this! This sounds/looks like heaven my goodness! Hi Meg, thanks a lot. I’m glad you like this. Thanks for stopping by. These are beautiful. I couldn’t agree with you more about sitting down and slowing down for your meal. I insist on bringing our little family together at the table every night for dinner. It is such a fabulous time to sit and hear about the experiences we all had during the day. And what a perfect way to stay in touch with your children and really listen to them. Our son has learnt so much about communication from sitting at the dinner & breakfast table and expressing his thoughts. I love your post today. Hi Seana, I also agree with you! Sitting together at mealtimes IS a perfect way to stay in touch with your children and to listen to what’s going on in their minds. Although my little one is only two, I use the time à table, to review our (his) day, asking him questions about where he went, what did he see, what is he eating, etc. It’s a wonderful time! How wonderful it is that you’ve already made it a priority to take the pleasure of sitting à table and slowing down, seriously. A great gift to your son! I’m glad you liked this post, thanks for letting me know! Thanks so much for sharing my recipes with your readers!